Detail : George's fourth solo single. This track was released as a preview for the "Dark Horse" album. It was recorded during sessions of September and October 1974 and was inspired by engravings carved into a wall in "Friars Park", his Henley-on-Thames home. George was sitting by the fire playing his guitar when he looked at carvings in the wall to the left of the fireplace, and saw, "Ring out the old, Ring in the new". He looked to the right and saw, "Ring out the false, Ring in the True". He was quoted as saying that he had seen this for five years and never realised they were lyrics to a song. 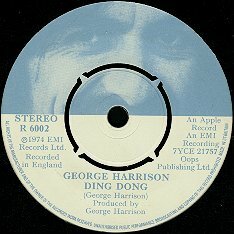 The B-side allegedly refers to George`s "My Sweet Lord/He`s So Fine" court case, and this track appears on no other release. The Apple label is replaced with a close-up of George's face.